India announced a predictable but strong 15-member squad for the upcoming World Cup in England starting end May. While most of the players selected themselves, the only question remained on the choice of a second wicket-keeper, an extra spinner versus pace bowler and the Number 4 conundrum. The Indian squad comprises of six batsmen (including two wicket-keepers), four all-rounders and five bowlers. 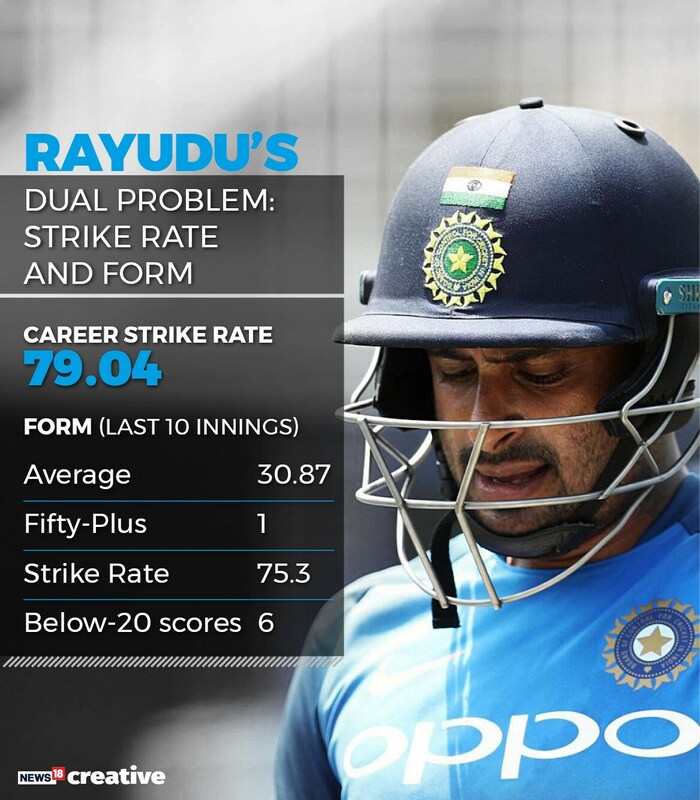 The biggest exclusion was that of Ambati Rayudu. A certainty till a few months ago, he did not find a place in the 15. Although he averages 47.05 in his 55-match career, his strike rate of 79.04 has been poor and well below the standard norm. His form of late has also been iffy – he averages just 30.87 in his last 10 innings and has scored at a rate of 75.3 with just one fifty. Vijay Shankar makes it to the squad on the back of some impressive performances over the last few months. He has the temperament to bat as a proper batsman in the top-order and can strike a heavy ball later in the innings if required. Although he has played just 9 ODIs for India, he did impress with a couple of performances in the home series against Australia. Overall, Vijay has a fine List-A record with 1613 runs in 55 innings at an average of 36.65 and strike rate of 92.48. KL Rahul also got the nod on the back of some impressive numbers in the IPL – he is currently the second-highest scorer in this edition with 335 runs in 8 innings at an average of 67 and a strike rate of 130.85 (including his maiden IPL hundred). Even more than the numbers what might have tilted the selection in his favour is the maturity and level-headedness he has displayed in some of his performances – playing the role of the anchor only accelerating at the end. This would have encouraged the think-tank to give him the green signal despite his mediocre ODI record – 343 runs in 13 innings at an average of 34.3 and strike rate of 80.89. While Vijay will start at Number 4, India also have the option of playing Rahul/ Kedar Jadhav at that position. Dinesh Karthik pipped Rishabh Pant in what was the most difficult selection in the squad. Pant, though on his day is as destructive as any batsman in the world, hasn’t shown the consistently expected at the international level. He has also displayed a tendency to throw away his wicket (after a good start) – as evidenced in this IPL. He is also inexperienced and has done nothing spectacular in the 5 ODIs and 15 T20Is he has played for India. Karthik, on the other hand, has played 91 ODIs for India and more importantly been in excellent form having scored 425 runs in 17 innings at an average of 47.22 since 2017. He has been a fine finisher in this time period scoring 330 runs in 11 innings at an average of 82.50 chasing targets for India. The Indian selectors decided to go with experience and Ravindra Jadeja was rewarded with a berth in the squad. Apart from being restrictive with the ball, Jadeja could be useful with the bat lower down the order and moreover would be a great asset on the field. Jadeja has an impressive economy rate of 4.75 in the 15 matches he has played for India since 2018. A good cushion for Kuldeep or Chahal, his addition will also lift the overall fielding standards, especially in the middle overs. Virat Kohli is inarguably the finest ODI batsman in the world and amongst the greatest of all times. He has scored 10843 runs in the format in just 219 innings at a staggering average of 59.57 and strike rate of 92.96. There has been no better match-winner with the bat than Kohli as suggested by his average of 77.27 in matches won. He is, by far, the greatest chaser in the format’s history with a mind-boggling average of 95.24 batting second. India has won 21 of the 25 matches when Kohli has registered a hundred chasing a target. Rohit Sharma and Shikhar Dhawan are amongst the finest opening pairs in ODI history. The duo have added 4541 runs in 210 innings at an average of 45.41 with 15 hundred-run partnerships. Rohit is the only batsman in ODI history to register three double-hundreds. 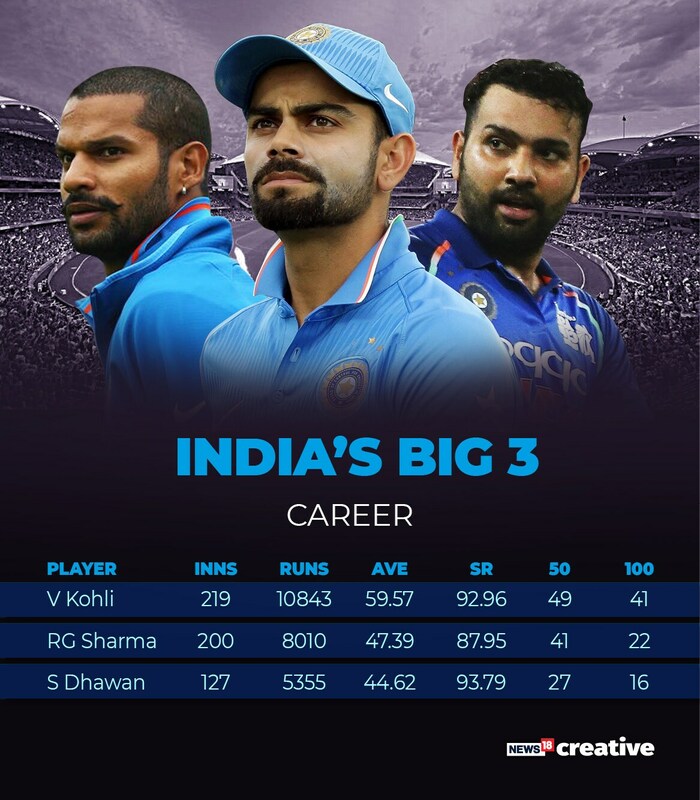 The top 3 for India have been in great form too. 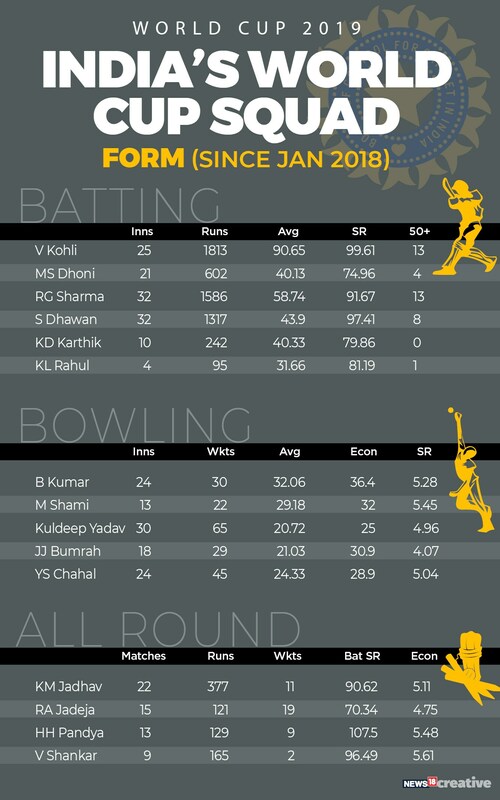 Since January 2018, no batsman has aggregated more runs than the Indian trio in the format. Dhawan is a big-match player and has a tremendous record in big tournaments. He has scored 1113 runs in 18 innings (World Cup and ICC Champions Trophy) at an average of 65.47 and strike rate of 97.71 including 5 hundreds. 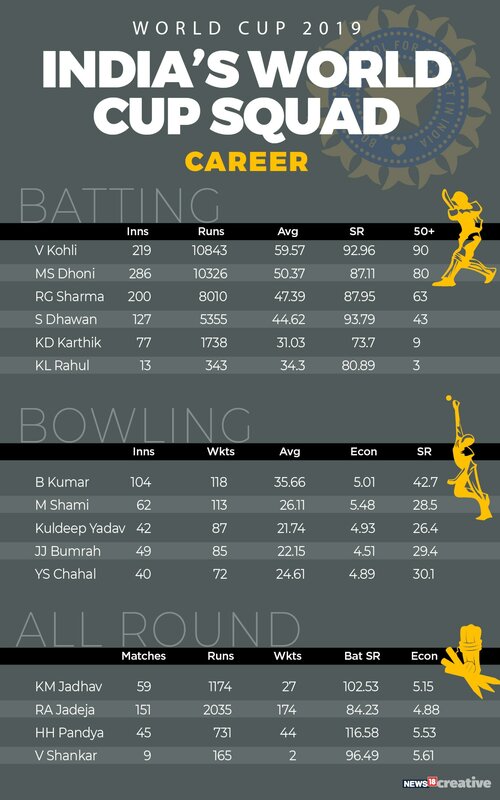 Dhoni is an all-time ODI great but his numbers have dwindled in the last few years. Since 2018, he has registered just 4 fifties in 21 innings and scored at a rate of 74.96. Given the fact that he bats in the lower middle order this will be a huge concern for India at the World Cup. Having said that he is still fit and excellent with the gloves behind the stumps, an asset in decision-making for Kohli in crucial moments, has an astute brain when it comes to field placings, bowling changes and using the DRS judiciously. His experience in big matches will be invaluable for Kohli and India on the field. Kedar Jadhav had made the No.6 spot his own. He boasts an average of 43.48 coupled with a strike rate of 102.53. Moreover, he has been very restrictive with the ball as his economy of 5.15 suggests. Hardik Pandya will certainly start as the number 1 all-rounder in the eleven but his recent numbers have been poor. In 13 matches since 2018, he averages just 18.42 with the bat. He hasn’t been a wicket-taking option either though he has been quite restrictive as the fifth-bowling option (economy of 5.48). But Pandya brings that X-factor with him - the ability to play that cameo and change the course of a match single-handedly. Jasprit Bumrah has picked 85 wickets in 49 innings at a stunning average of 22.15 (the best for a fast bowler since his debut) and economy of 4.51 in his career so far. 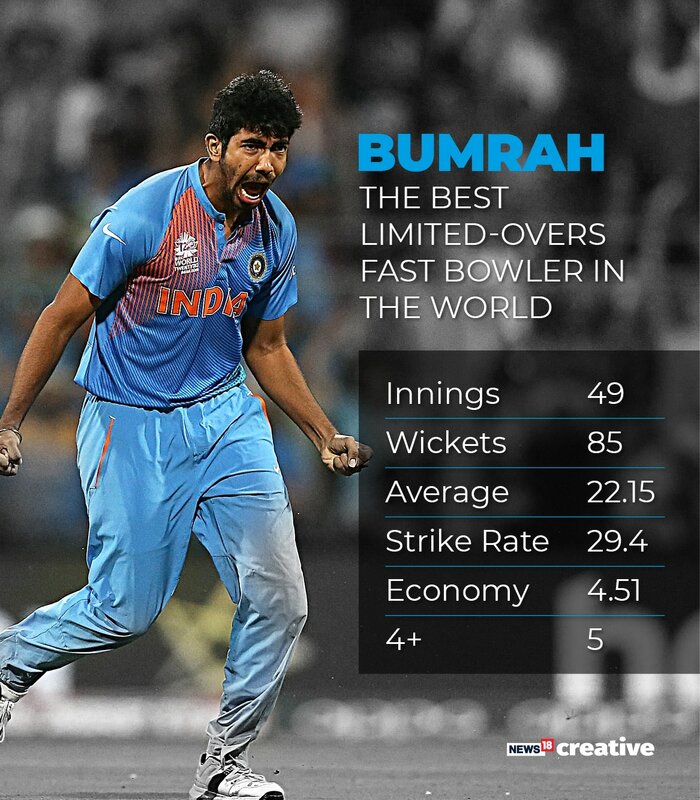 He is inarguably the best limited-overs’ fast bowler in the world and is brilliant at the death with his lethal yorkers. Mohammed Shami has been a revelation since his comeback to the ODI unit. He has picked 19 wickets in 11 innings in 2019 at an average of 26.42 and has also been very restrictive with an economy of just 5.13. Bhuvneshwar has been a consistent performer for India and will be very useful in English conditions. He has gone off the boil lately and is now the third seamer in the squad. Though very economical overall, he has conceded 6 or more runs per over on 9 occasions in 24 innings since 2018. Kuldeep Yadav and Yuzvendra Chahal form the most lethal spin-bowling pair in contemporary limited-overs cricket. Kuldeep is the leading wicket-taker in ODI cricket since 2018 with 65 wickets in just 30 innings at 20.72 apiece. He has picked as many as four 4-wicket hauls and one five-wicket haul in this period. Chahal has picked 45 wickets at 24.33 apiece in this time-period. Being wrist spinners, they are attacking options for captain Kohli and not only pick a heap of wickets in the middle overs but also keep the batsmen on a tight leash. Not only do India have a good and balanced line-up but also a squad flooded with match winners – players who can win them the match single-handedly – whether a Kohli, Rohit, Bumrah, Kuldeep or even Hardik. This is why this Indian team has been so consistent in the last few years and will go into the World Cup as one of the favourites.